A genetic "booster shot" could be in store for U.S. soybeans with the public release of three new germplasm lines from Agricultural Research Service and University of Illinois scientists. The soy releases are the result of a 20-year collaborative effort in which scientists cross-bred commercial varieties with exotic strains of the bean from the USDA Soybean Germplasm Collection kept at ARS's Soybean/Maize Germplasm, Pathology, and Genetics Research Unit in Urbana, Illinois. "We released this material to broaden the genetic base of the U.S. soybean crop, which is very narrow," says Randall Nelson, who leads the unit. The exotic parents of these lines are unrelated to the commercial varieties currently being grown, so the genetic differences, combined with high yield, will help in developing new varieties that are even more productive. "Less than 1 percent of the genetic diversity available has been used in developing our current cultivars," says Nelson. "Incorporating this exotic germplasm into improved lines makes such diversity more accessible to those developing the new varieties." For example, two of the new soy releases, LG97-7012 and LG98-1445, are crosses of U.S. varieties and accessions collected from China and Japan in the 1930s and mid-1950s. About 25 percent of their genetic makeup is Asian, but a third release, LG98-1605, is 100 percent exotic. It was developed from crosses of foreign accessions only, making it just the second germplasm line of its kind to be released for commercial use by U.S. plant breeders, notes Nelson. Of the three releases, LG98-1445 had the highest average seed yield during field trials from 2001 to 2002 at 28 different locations in 10 states. In fact, it consistently yielded more than the commercial check variety included in those tests. Despite such high marks, the soy lines aren't intended for stand-alone use, but rather as parent plants for breeding new, finished varieties. 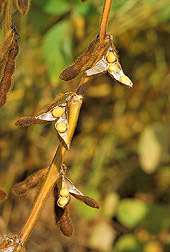 The new soybean lines have other characteristics similar to commercial varieties so that they stand well in the field and produce seeds with similar amounts of oil and protein. And LG97-7012, but not the other lines, is resistant to the fungus Phytophthora sojae, which can cause root and stem rots, says Nelson. His lab is now scrutinizing the lines' DNA to determine whether their genes for high yield are similar to or different from commercially grown varieties. Using molecular genetic techniques, he says, "We can examine these lines at the DNA level, find those areas of the genome that increase yield, and determine whether the genes for that increased yield are coming from the exotic parent. "If we can find genes from exotic germplasm that increase yield and do not exist in our current varieties, then we'll be adding new yield potential for U.S. farmers that wasn't available before," says Nelson.—By Jan Suszkiw, Agricultural Research Service Information Staff. This research is part of Plant, Microbial, and Insect Genetic Resources, Genomics, and Genetic Improvement, an ARS National Program (#301) described on the World Wide Web at www.nps.ars.usda.gov. Randall L. Nelson is in the USDA-ARS Soybean/Maize Germplasm, Pathology, and Genetics Research Unit, 1101 W. Peabody Dr., Room 232, Urbana, IL 61801; phone (217) 244-4346, fax (217) 333-4639. "New Soy Germplasm Delivers High Yield, Genetic Diversity" was published in the July 2004 issue of Agricultural Research magazine.